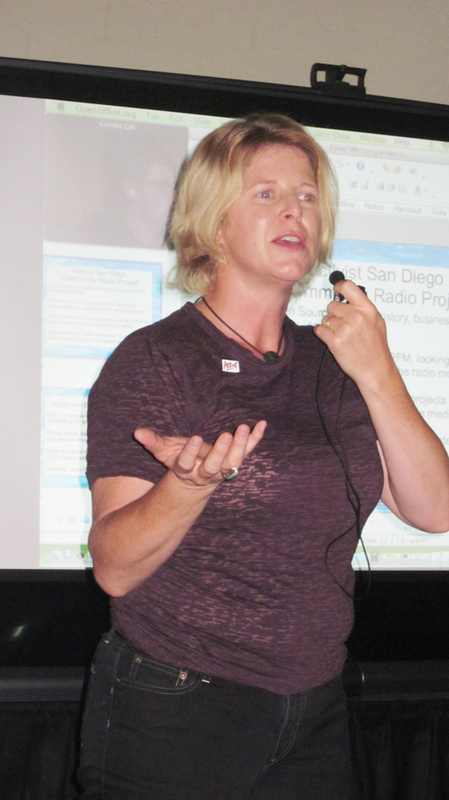 Members of San Diego's activist community gathered together at the Media Arts Center in North Park on August 29 to hear about how low-power FM (LPFM) radio can create new opportunities for progressive media and break the Right-wing stranglehold on the local airwaves. The attendees heard a presentation via Skype from Philadelphia-based Ian Smith of the Prometheus Radio Project, which was instrumental in lobbying Congress and the Federal Communications Commission (FCC) for the LPFM opportunity in the first place, and also heard from representatives of the World Beat Center, Media Rights Coalition and Activist San Diego. Radio has the power to be a real presence in a local area and bring diverse groups together for a real sense of community. But in the U.S. that rarely happens because almost all the major frequencies are owned by giant media conglomerates and many of them are broadcasting programs that originate from production centers thousands of miles away. But the Philadelphia-based Prometheus Radio Project has been working hard to make local community-oriented radio a reality not only in far-flung rural areas but in major cities like San Diego � and on August 29, local activists gathered at the San Diego Media Arts Center in North Park for a local event as part of Prometheus�s �Radio Summer� campaign to build as many Low-Power FM (LPFM) stations as possible in San Diego and throughout the U.S.
�Radio Summer� came about as a result of Prometheus�s decade-long campaign to open up more space on the radio dial for LPFM. On January 4, their efforts paid off when the U.S. Congress passed the Community Radio Act and President Obama signed it into law. �It gives the U.S. Federal Communications Commission [FCC] authority to license over 1,000 low-power community radio stations, probably the largest expansion of community radio in our nation�s history,� said Ian Smith, national outreach coordinator for Prometheus, who addressed the local meeting via a Skype link from his home in Philadelphia. Smith explained that LPFM licenses are issued to nonprofit organizations, including schools and churches as well as community groups. The licensees have to have educational missions and the stations have to be locally owned and operated. LPFM stations existed before the Community Radio Act was passed, but virtually all of them were in rural areas, remote from major population centers and therefore not serviced by commercial or mainstream public stations. Under the new law, and the rules the FCC approved in July to implement it, San Diego and other large cities will get access to LPFM for the first time. Prometheus�s goal, Smith said, is to get 1,000 LPFM licenses approved by the FCC by the summer of 2012. According to Smith, LPFM and other community-based radio stations do a lot more than just broadcast news and entertainment. �Community radio has been used to clean up toxic waste, organize migrant farmworkers, clean up after Hurricane Katrina and get community and musicians exposed.� Though the stations are only allowed to broadcast at 100 watts of power, for a range of three to 10 miles, they can be a powerful organizing tool precisely because their small power and range makes them �hyper-local,� Smith explained. As newspapers continue to decline and digital media become more important, Smith said, LPFM will be an important community tool to reach a large but still localized audience. One person in the meeting said he had logged on to a Web site that purported to identify potential LPFM sites and had got back the discouraging news that there would be at most just one possible station in San Diego � and it would be located in University City/Miramar, away from the city�s population center and far from the progressive communities south of interstate 8. Smith said that the site this person had looked up �won�t give you any false positives but it does give you false negatives. The FCC doesn�t have the rules yet and we won�t know where the opportunities are until January.� He pointed out that the FCC had extended the comment period during which people can write them with input on the proposed rules, and urged people to write them to demand rules that will allow San Diego to have up to five LPFM stations. One of the announced speakers at the meeting was Makeda Cheatom, director of the World Beat Center in Balboa Park and host of a reggae program on commercial radio in San Diego for 30 years. (It now streams on the Internet at www.oneworldreggae.com.) Because of her radio experience and the World Beat Center�s roots in and outreach to the African-American community, her organization is expected to be a front-runner for an LPFM station in San Diego. Cheatom arrived only at the end of the meeting � she�d been in Mexico earlier in the day and had got stuck at the border � but Jesse, a volunteer with her group, gave a presentation for her emphasizing the need to use LPFM to reach out to immigrants and communities of color. Attorney Art Neill, director of the local New Media Rights coalition, explained the concept of �Creative Commons� licensing and how it works as an alternative to traditional copyright law. He explained that the �Creative Commons� concept was originally devised by independent software writers and engineers, who realized �that traditional copyright didn�t really apply to software.� As an alternative to commercial software from companies like Microsoft, they started writing programs of their own � and posting the code for them on the Internet so others could examine the programs, improve them and offer fixes for any bugs they might contain. �Five to 10 years ago,� Neill said, �people decided that maybe they wanted to share their content as well� and allow others to modify it or create new (so-called �derivative�) works based on it without the hassle of licensing and the expense of paying royalties. Creative Commons is a sometimes confusing concept because there isn�t just one Creative Commons license, Neill explained. Instead there are six alternatives, all available online, which differ mainly in terms of which rights the creator keeps control over and how much he or she allows others to reuse or share the work. Some Creative Commons licenses allow for unlimited reuse, some require that the original creator be given credit, and some allow for noncommercial reuse only. Playwright Charles Mee allows other writers and acting companies to create works based on his plays, but he retains traditional copyrights so that anyone performing one of his scripts exactly as he wrote it has to license it and pay him royalties. Neill said that Creative Commons offered LPFM stations an alternative to having to pay the high licensing fees charged by companies like the American Society of Composers, Artists and Publishers (ASCAP) and Broadcast Music, Inc. (BMI), which between them control virtually all the music heard on commercial radio. �You can find music and content you can reuse,� Neill said, either by dealing directly with local artists and asking for permission to play their songs for free, or logging onto Web sites that already offer Creative Commons music that can be downloaded and played on the air or on other Web sites. Kelly Barnes spoke both for Activist San Diego � whose own radio project, a full-power nonprofit educational station in the Descanso/Julian area, isn�t part of the LPFM movement but will probably operate much like an LPFM station � and also for Open Media City Heights, whose proprietor, Brian Meyers, recently ran a streaming audio service covering the City Heights area with LPFM-style radio content. When Meyers had to give up this project because the Media Arts Center hired him for a full-time job, he donated his equipment to ASD to set up their own radio streaming project, both to get their content online as soon as possible and to offer a preview of what the Descanso station, KNSJ, will broadcast once it goes on the air in late 2012 or early 2013. �ASD has a strong local identity,� Barnes said. �The vision is to build the local capacity for radio with 1,000 content producers. We would like to be both a vessel and a training program.� One of Barnes� priorities is to demystify radio production and teach people how simple it is to create radio shows with everyday equipment. When California Governor Jerry Brown signed SB 48, the law requiring California public middle and high schools to teach the contributions of Queer people, Pacific Islanders and people with disabilities, Barnes and this reporter did a one-minute radio segment, recording an interview on Barnes� smart phone which she later edited using open-source software. The result was picked up by the Free Speech Radio Network and aired on over 1,000 noncommercial radio stations and Web sites.